The pieces of this novel came from a couple of influences. In my back yard, there is a place in the yard where there is a clear mark of a former small building, long gone, but having left its outline in the soil. I’ve often wondered what it could have been, and if there might be some structure even deeper that I might discover if I ever tried digging for it. That thought stayed idly in my mind for years until we were on a trip, traveling I-90 through South Dakota. We stopped at Chamberlain for something and I was struck by how pretty the place was, on the banks of the Missouri River, and also by the extensive sunflower fields in the surrounding farmland. What could be hidden under those fields? A little research led me to realize that this land was formed as the muddy residue caused by the melting of the ice from the last ice age ten thousand years ago. Since I was already in the habit of looking for science fiction themes in small towns, it came naturally to think of a buried flying saucer, trapped there by that ancient mudflow. The TV series Stargate made it natural to consider an active wormhole inside that saucer, but of course with my own brand of speculative physics. The idea of a spacecraft with an always-open portal to the home world (Bak) gave me some ideas to play with — like a simple rocket-like propulsion that could travel the great distances between stars with ease simply because it didn’t have to bring fuel. It could be constantly refueled from home. Even the crew could commute home, and if a disaster happened when they arrived at their destination (Earth) then they could simply lock the doors and go home. The farmers that had been growing crops above the buried saucer for generations were in some sense based on my own family. They were lightly psychic — just ordinary people who occasionally had things happen to them, like picking up the phone right before it was going to ring. Just ordinary things that could hardly be called psychic — unless they tended to happen all the time. Just coincidence — that’s my story and I’m sticking to it. The cover is also one of my favorites, with lots of extra detail the artist included to reward anyone who looks at it closely. 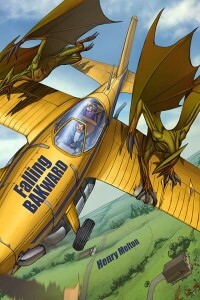 So with a backyard alien invasion and ordinary farmers holding the line, Falling Bakward is my favorite.